This is the third installment of my Cheng Pei-pei review series. You can see my others here: Come Drink with Me & Brothers Five. Again, for those who do not know her name, Cheng Pei-pei is probably familiar from her role as Jade Fox in Crouching Tiger, Hidden Dragon. Cheng Pei-pei "Queen of Swords"
The Lady Hermit is not only one of my favorite Cheng Pei-pei films, it also one of her last movie before she semi-retired from Hong Kong cinema and moved to America to start a family and open a dance studio and pursue television. Thankfully, she did return to make more films. In the old-school wuxia of the 50s and early 60s, female martial heroes were a staple, and common protagonists. King Hu's Come Drink With Me, which starred Cheng Pei-pei, marked the shift to new school wuxia, with greater focus on realistic bloodshed. The film was such a success that it made Cheng Pei-pei a star and led to other female knight errant vehicles. Though the wuxia genre had featured many females in prominent roles to this point, the global Kung Fu explosion of the 70s (that started with Bruce Lee) changed things and women were increasingly given less screen time in swordplay films. In an interview Cheng Pei-pei regarded her decision to move to the US favorably in light of this development saying "When Bruce Lee arrived, actresses started to have very small parts. It’s a good thing I left when I did, otherwise I might never have left." I think this is another reason her movies are important. They are a different kind of martial arts experience that was overshadowed for a time after Lee's break-through in The Big Boss. This isn't to detract from Lee. There is a reason he became such a hit and that his films continue to resonate. I love 70s Kung Fu movies as well as new wuxia, but it did have an impact and I think one of the downsides is less interest in prominent female roles for over a decade and less interest in the elegance and flow you find in Cheng Pei-pei's movies. 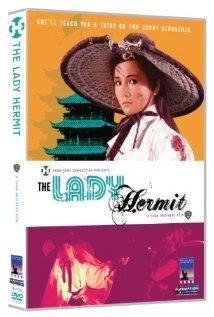 The Lady Hermit was made in 1971 by Shaw Brothers Studio and directed by Ho Meng-hua. The movie stars Cheng Pei-pei as Leng Yushuang (better known as The Lady Hermit), Shih Szu as Cui and Lo Lieh as Cheng-chun. The main villain, Black Demon, is played by Wang Hsia. Notably, Sammo Hung has a very small role as one of the Black Demon's minions. The Lady Hermit was meant to serve as a vehicle for establishing Shih Szu as the next Cheng Pei-pei. This is reflected in the plot of the film and Cheng Pei-pei has since expressed her dislike of the idea. The story is quite simple and the action does not dominate the central focus, which is the relationship between the three main characters: Lady Hermit*, Cui and Cheng-chun. The film opens in Baijang Town with a gruesome off-camera murder committed by mysterious masked men. Later we learn the murder is part of a protection racket arranged in the name of Lady Hermit (but in actuality by her enemy Black Demon as an attempt to lure The Lady from hiding). The film then shifts to another nearby town where the young Cui has come in search of the famous Lady Hermit, who has been in hiding for the past three years after being defeated by Black Demon. Cui is bold but overconfident and even callous. She finds work and lodging at the Da An Security Company which transports and guards goods for local merchants. Da An is operated by the kindly Mr. Wang. At the company headquarters Cui meets a maid named Leng, who is later revealed to be Lady Hermit. Another member of the security company, Cheng-chun, agrees to take Cui to Baijang town with a shipment to follow rumors of Lady Hermit in the area. While there, she learns that the Chun Kuei Temple is selling protective charms for ten taels in the name of Lady Hermit and that households who do not display the charms on their windows, get murdered in the middle of the night (thus the murder sequence at the start of the movie). She and Cheng-Chun return to the Da An Security company and Cui tells Leng about the temple and its alleged ties to Lady Hermit. Cui and Cheng-chun return to the temple that night to investigate and discover an impostor Lady Hermit who threatens to kill them if they don't reveal the real Lady's whereabouts. At the final moment, Leng arrives and an enormous battle ensues culminating in a duel between the two Lady Hermits. The heroes are victorious but Leng leaves the Da An Security company and goes back into hiding now that her identity has been revealed. Cui is determined to learn martial arts from Lady Hermit and tracks her down by hitching a ride with a wagon. She then convinces the Lady to accept her as a student after many failed attempts to persuade her. The two take-up residence in an abandoned cottage and Cui begins her training. Cui returns one last time to Da An Security to say good bye to Cheng-chun, whom she has fallen in love with. She tells him she has found the Lady Hermit, and agrees to teach him what she learns in the evenings if he meets her at the cemetery. Cui's attempts to woo Cheng-chun are complicated by his secret love for Leng. This love triangle forms the core of the story. During her training, Cui learns that the Lady Hermit has been in hiding for three years, after she was seriously wounded by Black Demon. Like Cui, the Lady wanted to be a hero and rid the world of evil, but could not defeat him. Her wound still troubles her and impedes her ability to fight at times. She has also been developing a technique, called Flying Tiger Style, to counter Black Demon's "shadowless claws" and throws. She teaches this to Cui, hoping one of them will be capable of destroying her former nemesis. While Cui is away from the cottage on an errand, Black Demon learns of Lady Hermit's connection to the Da An Security company and sends men there to find her. The head of the company, Mr. Wang, refuses to reveal anything and the whole household is slaughtered. Cheng-chun is nearly killed in the battle and ensuing fire, but flees to the wilderness and desperately calls for Lady Hermit who finds him. This is where one of the most impressive scenes of the movies takes place, in which Leng assaults the murderers at tea house and litters the place with corpses. I will talk about this more below in the section on swordplay. Leng returns to the cottage, where Cheng-chun is staying in separate quarters. They both share affection for one another, but Lady Hermit says she has vowed no other pre-occupations until she kills Black Demon, so she cannot give him her love. Still they enjoy many sweet moments and an evening together in the cottage hiding from a particularly nasty storm. Cui returns to the cottage after this storm and is furious to discover her master and Cheng-chun have stayed under the same roof. She vents her jealousy at Cheng-chun during their training and eventually storms off to kill Black Demon in a fit of rage. Lady Hermit and Cheng-Chun follow after her, leading to the climactic confrontation of the film. After a massive assault on Black Demon's compound, Lady Hermit kills him using her flying tiger attack, though she is very badly wounded in the process. In order to restore peace between her and Cui, she plunges her saber into the ground and leaves while her two companions are exploring a chamber in the complex. When Cui and Cheng-chun return they find a blood written note that reads "Good riddance to evil. My sword is a wedding gift." After which Cui weeps and vows to find her master. There are many very well executed action sequences in The Lady Hermit but it does a good job of not overdoing it. This is a strength of the film. There are extended periods in the center of the movie where very little action occurs and we have opportunities for character development. That said, this is classic Cheng Pei-pei, and makes solid use of her smooth, flowing strikes and her graceful footwork. Something also needs to be said about the cinematography and art direction. This is a very well shot movie and things seem carefully placed. There are several moments like this, but the most memorable is the point-of-view from Black Demon's perspective when he and Cui meet for the first time (above). The Lady Hermit also features a whip, wielded by Cui at the start of the film. You don't see whip used so extensively so this was a nice change of pace, though another Cheng Pei-pei movie from the same year, The Shadow Whip, does feature one. I think the climax of the film has the bulk of the best swordplay. There are some truly exceptional swordplay and action scenes in this portion of the movie. Much of the action centers on Shih Szu as Cui, but Cheng Pei-pei has the more impressive sequences. We get a series of fast paced, sword twirling episodes over a wide variety of locations, raging from a road-side tavern to a collapsing rope-bridge and even a Pagoda scaling. The final showdown between Lady Hermit and Black Demon is stellar. It is also rare because we get to see Cheng Pei-pei drop her sword and resort to hand-strikes and throws for a change. Unfortunately I could not find a clip of the final battle. But this clip of the movie's kill counts, put together by a fan, does give a good idea of the kind of swordplay to expect in the movie. In particular it highlights the footwork and spinning sword flourishes I mentioned above. *Also called Leng or Leng Yushuang through the article.